The Latin American Internet retailer's shares regained some lost territory last month. What drove shareholders' optimism. What: MercadoLibre, (NASDAQ:MELI) stock appreciated 25.3% during the month of November, according to S&P Capital I.Q. data. So what: The Latin American e-commerce giant reported vigorous third-quarter 2015 earnings on Nov. 4, causing the stock to appreciate nearly 9% in the subsequent trading session. MercadoLibre shares continued to post steady gains throughout the rest of the month. Yet the third quarter allayed some of these concerns, as the company reported brisk sales in both dollar and local currency terms. MercadoLibre generated $168.6 million in net revenue -- a 14% increase when denominated in U.S. dollars, and a 68% increase in local currencies. 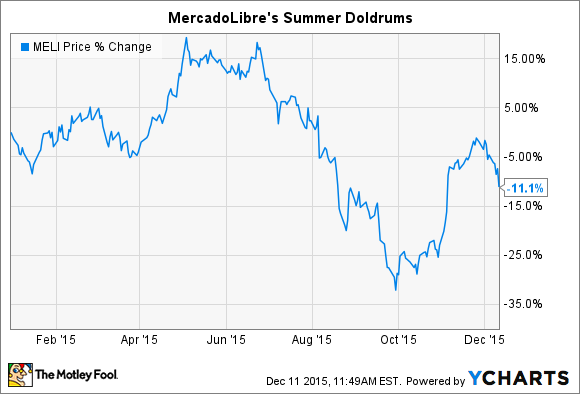 With some relief, MercadoLibre saw dollar pressure ease a just a bit in Q3. The company's 27% operating income margin marked a decline of 5% from the prior year, with foreign currency translation responsible for nearly all of the margin compression. But this is actually somewhat encouraging, as during the last sequential quarter (Q2 2015), Mercado's operating margin declined 10.7%, of which 7% was attributed to foreign currency impacts. The inference is that in Q3 2015, MercadoLibre ran operations more efficiently, while enjoying a slight relaxing of currency headwinds. The company ended the quarter with a net profit of $45.6 million, a 35% increase. This proved a more than pleasant surprise to shareholders, after Q2's 39% decline in net income versus the prior year. Now what: In this last quarter of 2015, investors can entertain a promising narrative regarding MercadoLibre. That is, the continued rapid growth of Gross Merchandise Volume (or "GMV," a measure of all transactions MercadoLibre facilitates) will offer some protection from the erosion of Latin American currencies vis-a-vis the mighty dollar. Last quarter, GMV rose an an enormous 77% in local currency terms, to $1.84 billion. Additionally, over the long term, MercadoLibre's maintenance of a market-leading e-commerce position in Latin America should return an unanticipated dividend for patient investors. Major currencies tend to move in years-long trends. At some point, it will be time for the dollar to reverse course and weaken against emerging market currencies. Such a period will provide welcome revenue and earnings boosts to MercadoLibre shareholders.